When the Amazonian princess Diana becomes Wonder Woman, she leaves behind her identity and begins a new one. Besides her heritage, she has many more secrets. One is her superpowers. Her strength in stopping bullets with her mystical armbands and using her golden lasso to force the truth out of people are skills highly coveted by the Justice League. Join their ranks when you slip into Wonder Woman's famous costume. 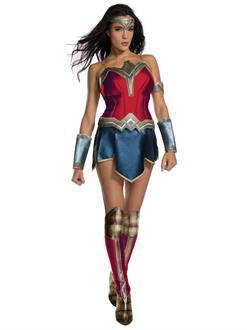 The red and blue outfit with metallic-colored accents was made more popular with the recent "Wonder Woman" movie with Gal Gadot as the star. This set also includes a belt, gauntlets, armband, tiara and boot tops.